Three dead, officer shot Reviewed by Edgeville Buzz on February 27, 2011 . Last night seemed more like an episode of Fox’s fictional “Chicago Code” than a typical winter night in Edgewater – there were throats slit, police chases and gun battles on the street. 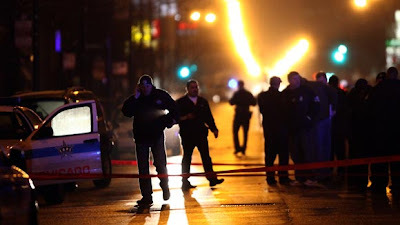 The tragic evening began around 5:30PM when a gang investigations unit of the Chicago Police Department observed subjects running from a building on the 5800 block of North Winthrop. Police found three victims in the building with their throats slit and restrained with duct tape, two of which have died. Those fleeing the building jumped into a pickup truck and were chased by CPD and the suspects rammed a police car and shot at others. One officer was shot at the intersection of Thorndale and Broadway. Eventually, the pickup truck crashed at Devon and Greenview and police returned fire, fatally shooting one of the suspects. Two others were arrested at the scene. It has been reported that the officer shot, a 39 year old male and 12 year veteran of the force, is expected to be OK.
UPDATE: The Chicago Tribune is reporting that the suspects were a part of a “crew” that did business with a large drug cartel and may have been involved in 13 other drug-related murders around the city. The man shot by police, Arturo Ibarra, was the ringleader of the group. Also see this Sun Times article.